I think Steve Bartman was sitting in front of me at the Mets-Cubs game on Saturday night. It was maybe the third most unlikely thing I experienced that day. When I went to bed late Thursday, after the Mets had beaten the Dodgers to advance to the National League Championship Series, I knew Saturday was going to be epic. My wife and I would drive to Queens to watch the Michigan-Michigan State football game with two fellow Michigan alums and then pop over to Citi Field for the Mets game. Michigan had lost its opener but won all five since, including three straight shutouts, to move up to No. 12 in the AP Poll. Michigan State was undefeated and ranked seventh. Each team could look ahead to the rest of its schedule and envision minimal resistance until a late-season showdown with Ohio State. The winner had an inside track to both the Big Ten championship and a playoff spot. The Mets were starting a best-of-7 series to decide the National League’s World Series representative. If we’re just looking at one day, Michigan men’s basketball team playing for the national championship (2013), Game 7 of the NLCS (2006), or even Michigan football’s regular season 1 vs. 2 matchup with Ohio State (2006) probably had more significance than Saturday, where a win or loss in either case wasn’t necessarily going to decide the season. But never had I experienced a bigger multi-sport day. I hoped I’d go 2-0 but knew all scenarios were possibilities. Well, I knew almost all scenarios were possibilities. Michigan by no means dominated the Spartans but they led 7-0, 17-7, and 23-14. The game was scoreless for the first quarter and tied for 90 seconds in the second. Otherwise, Michigan led, even for a brief moment when the clock showed all zeros. Until the play you’ve surely seen by now, neither team had committed a turnover. They both struggled to run the ball (and make sense of the officiating crew). Michigan Is Back, we thought, and so was the rivalry. Neither of those thoughts became untrue when, with 10 seconds left in the game and Michigan leading 23-21, the Wolverines’ punter dropped the snap and a Spartan picked up the ball and ran 38 yards for a touchdown. * But Michigan was no longer winning. They were losing. And the game was over. The Spartan defender crossed the goal line as time expired. There were no flags on the field and no genuine reason for a replay, though given this crew I’m sure there was one. Michigan had made a blunder and there was no time for atonement. It was a one-in-a-really-large-number sequence in the final 10 seconds of game time that led to Michigan losing. It would have been improbable and stunning had the play occurred on one of Michigan’s earlier punts—they had seven of them, by the way, ranging from decent to awesome—but at least there would have been a chance to make up for it. This was the ultimate gut punch, in the way that only sports can be. *The decision to punt was the correct one at the time, in my eyes. I think any criticism can only be levied in retrospect, and while that’s unfair, I was reminded after the game that television networks pay a lot of money to certain people to do just that. Oh, and it wasn’t even the most pathetic play out of a punt formation this past weekend. Unfortunately, I am a veteran of gut-punching losses. I was starting my senior year when Michigan football lost in what is considered by many the greatest upset in the history of sports. I watched on TV as the Mets lost that aforementioned Game 7 and when Luis Castillo dropped a routine pop-up to lose to the Yankees. The latter game was far less important than any of the other mentioned here, but still excruciating. Heck, my younger brother referenced it in his Best Man speech at my wedding two months ago. I can’t tell you exactly where Michigan’s loss on Saturday ranks. Putting one’s worst defeats in order seems like the most sadomasochistic exercise a sports fan can undertake. Isn’t it enough to say my favorite football team lost an important game to a major rival in a way I’d never seen any other team lose? Our Alum Friend No. 1 grabbed his/her puppy—every Michigan fan needed a personal puppy at that moment—and walked out of the apartment. Alum Friend No. 2 unleashed a torrent of obscenities that would make Samuel L. Jackson uncomfortable. * Megan was equal parts angry and shell-shocked and kept repeating, “I can not believe that just happened.” My reaction in scenarios like this is stunned silence followed by days of discussing the exact details. I am often the quietest for the first few hours and the most talkative by the time everyone else just wants to move on. 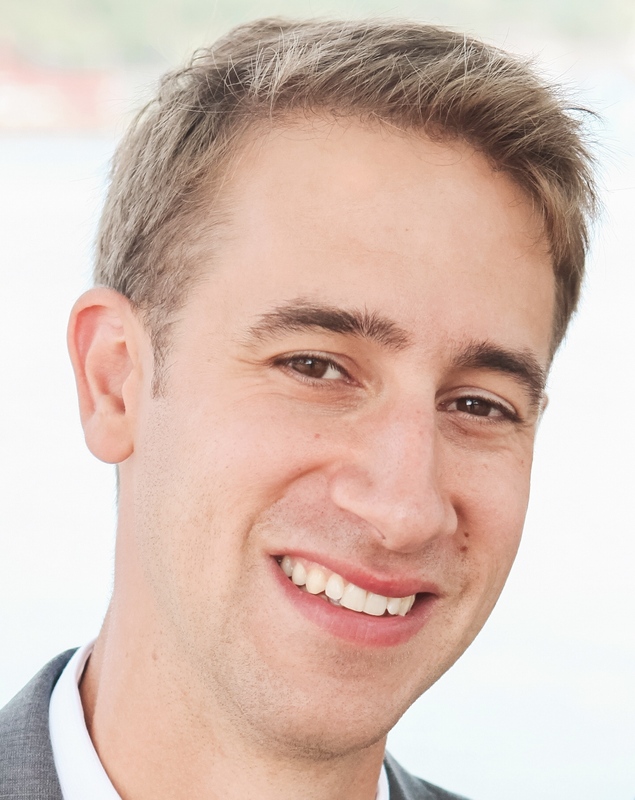 *Andrew J. Kahn, protecting the identity of his friends and readers since 2009. This situation was especially unique since Megan and I had a post-game commitment. The nearly four-hour football game—thanks, inept referees who needed replay review every other play!—meant we arrived at Citi Field just in time for first pitch. We should have been riding high after a big win, with our happiness turning to greed as we looked to sweep the day’s events. Instead, I was relying on the Mets—the Mets!—to salvage our spirit. There was a period in my life when I hoped August 19th fell on a Mets off-day so they wouldn’t ruin my birthday. This was the team I was depending on. *A recent example: I was too superstitious to buy champagne before Game 5 of the NLDS, but I figured I could slip hard cider past the baseball gods while still having the same sort of celebration should the Mets win. I ended up in my backyard around midnight dumping the cider over my head. So yeah, I was able to soak in the glory of the Mets moving one step closer to the World Series. It helped that we were shown on television several times. Our phones started blowing up after Curtis Granderson broke a 1-1 tie in the fifth with a run-scoring single. 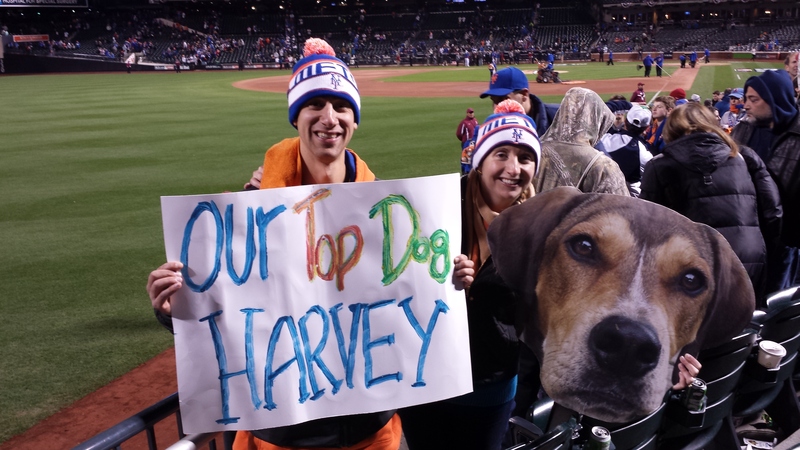 Friends had seen us holding our homemade “Who Let the Mets Out?” sign and accompanying fathead of our dog, Harvey. Later, as Harvey the pitcher racked up the strikeouts, TBS cameras showed us again, this time with the other side of the sign displaying, “Our Top Dog Harvey.” The jumbotron at the stadium showed us twice. Someone at the Mets/Cubs game has a sign that reads "Who let the Mets out?" How is this person not a GOP prez candidate? The Mets fan with the "Who Let The Mets Out?" sign likely just woke up from a 15 year coma. In his world the Mets are defending NL champs. Dude with the "Who Let The Mets Out?" is the best fan in the building. Old school. Embrace the embarrassment. A word on that last tweet: I find the Mets’ adoption (and adaptation) of the song more endearing than embarrassing. Fans embraced it at the time—at least my friends and I did—and I loved hearing it at the stadium again, through my TV, during Game 2 on Sunday night. It’s certainly more organic and less cliché than force-feeding us Billy Joel during the middle of the eighth. Or even worse, “Sweet Caroline,” as the Mets did several years ago, disregarding the fact that the Red Sox already played it. To continue the Mets-Michigan theme here, it’s like when Michigan introduced “In the Big House.” Fans hated the song and rightfully so. Traditions aren’t created overnight by marketing departments. I’m not comparing “Who Let the Dogs/Mets Out?” to “The Victors,” but at least it was Mets, just like “Lazy Mary,” played right after “Take Me Out to the Ballgame” during the seventh-inning stretch, is Mets. Michigan played its first football game in 1879. It deserves a timeless fight song. The Mets are an expansion team that has always played second fiddle in its own city. Their fans will accept quirky. 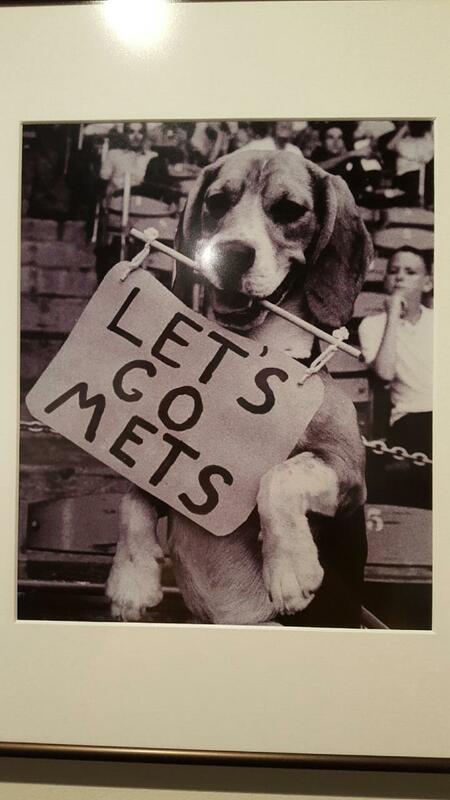 While TBS was misidentifying our mutt as a beagle—though Harvey does resemble the Mets’ original mascot—fans sitting near us got word that they, too, were spotted on TV. By then Megan had already shared with them the story of Harvey the dog, the fathead, and the signs. When a guy in our row tried to pass down a dollar to a beer vendor as a tip, he decided he’d rather we keep it and buy Harvey a biscuit. Suddenly a biscuit fund was being discussed. One fan wouldn’t let us get our own concessions lest we miss out on more TV time, and earnestly tried to rebuff our refund attempts. One fan who wasn’t sharing in the “beagle love,” as Ernie Johnson had said on the broadcast, was a guy one row in front of us dressed in a dark jacket, glasses, and Cubs hat. He had black hair and appeared to be in his mid-30s. He was sitting in the first row along the left field line, even with the left fielder. See where I’m going with this? I THINK IT WAS STEVE BARTMAN. I regrettably did not get a photo but he looked very much like the guy who interfered with a foul ball in that memorable playoff game at Wrigley. Oh, and he moved—or should I say, escaped?—to New York from Chicago in 2003. We left the stadium—a man pointed in our direction and told the woman with him, “Hey, there’s that dog!”—and joined the mob shuffling to the subway platform. Some loudmouth asked his friend if he’d seen the end of the Michigan game. He hadn’t. “State returned a punt with no time left to win the game!” the loudmouth told him. If only Michigan State had simply “returned a punt” on the final play to beat Michigan. That would have been a far more normal ending. We returned to our friends’ apartment. I watched as Utah attempted a pass from its own end zone on a kickoff return and get called for a safety. My Football Weirdness Scale needed so much recalibrating that this didn’t even register as unusual. I didn’t see it, but I was told Megan and I were shown on SportsCenter with the Mets highlights. So, too, was the Michigan ending.